Around 4:00am, October 10th, about 2,000 gallons of hydrochloric acid leaked out of a 45,000-gallon tank. The tank was sitting on a leak-proof containment sump, in order to contain a chemical spill or leak, if a hazardous situation were to occur. The spill did not harm personnel or the environment; it was contained with the leak-proof secondary containment sump. Hydrochloric acid is a very toxic substance and can release toxic vapors. The chemical can be harmful to personnel who come in contact with the chemical or the chemical’s vapors. Continental Teves Auto Parts uses the toxic chemical during a coating process for manufacturing brake calibers for the automotive industry. Plant managers were able to evacuate the factory before any hazardous situations were able to occur. Plant managers set off alarms and notified supervisors immediately. Eighty workers were quickly evacuated and no one was injured. The plant has arrangements with local fire departments, first responders and regional hazmat teams for complete safety. They arrived on scene promptly to evaluate the chemical spill and act accordingly. Plant manager, Jeff Scott, stated the plant’s safety plan functioned well and worked to keep everyone safe. On-site chemical response experts have cleaned up the spill. Hydrochloric acid must be stored in a well-ventilated and secure chemical storage building that offers protection from fumes, vapors and other noxious gases. When handling the colorless, toxic chemical, personal protective equipment such as PVC gloves, protective eye goggles, chemical resistant clothing and chemical resistant shoes should be used at all times. Hydrochloric acid forms acidic mists and toxic vapors that can have a corrosive effect on human tissue. 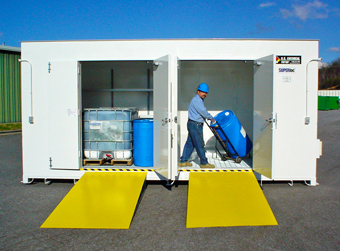 Non-fire rated CHEMLoc storage buildings are perfect for storing hydrochloric acid. Offering constant air circulation and protection from fumes and vapors, with mechanical ventilation, the CHEMLoc series storage facility will keep corrosives safe and protected. U.S. Chemical Storage offers a wide variety of explosion proof and non-explosion proof accessories that can aid the storage process for compliant storage solutions. U.S. Chemical Storage buildings meet and exceed all EPA, OSHA, NFPA and FM Approvals or Warnock Hersey standards. Hydrochloric acid storage solutions by U.S. Chemical Storage are completely customizable to meet all of your specific requirements. Choose U.S. Chemical Storage for hydrochloric acid storage solutions when storing large volumes or small volumes of hydrochloric acid inventory.